Vintage - Our researchers believe this to be a J & G Meakin Fine Bone China, made in the Mid-Nineteen Hundreds or before. Pattern #4509, having Burgundy Stripe, Polka Dots, and 22kt Gold. 27 Pieces. A very beautiful and Feminine Tea Set, Service for (8) Eight. We believe it to be a J & G Meakin Pattern in White/ Burgundy and 22kt Gold. 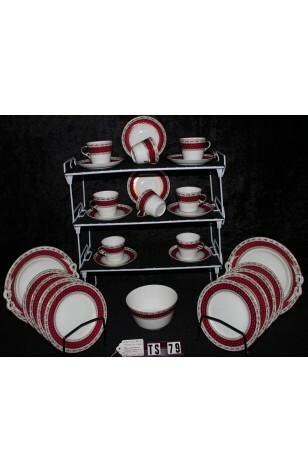 All Items have a Burgundy Stripe with White Polka Dots Painted on the Stripes, 22kt Gold Criss/Cross Verges, and Gold filigree Stripe on the Rim. Rims of the Plates are 22kt Gold, as are Cup Handles. Platters have Handles shaped like Ribbon Bows. One of the most beautifully appealing Tea Sets you'll ever find. You'll be proud to entertain with it on your table. A very beautiful and Feminine Tea Set, Service for (8) Eight. We believe it to be a J & G Meakin Pattern in White/ Burgundy and 22kt Gold. All Items have a Burgundy Stripe with White Polka Dots Painted on the Stripes, 22kt Gold Criss/Cross Verges, and Gold filigree Stripe on the Rim. Rims of the Plates are 22kt Gold, as are Cup Handles. Platters have Handles shaped like Ribbon Bows. One of the most beautifully appealing Tea Sets you'll ever find. You'll be proud to entertain with it on your table. In Great Resale Condition unless note below or in pictures.